Discussion in 'Hats' started by ScottyBlues, Jan 31, 2008. I've done a search and there is just too much to read. I'm looking to buy a Panama hat for this summer, and I want the collective wisdom from this group of which to buy. Maybe that could be a sticky, an article with the top contenders for each hat style. 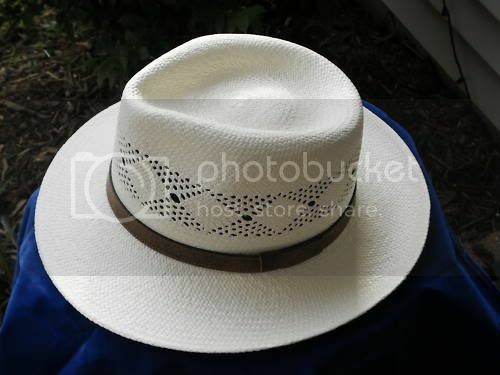 I'm looking for a traditional Panama in white or off-white, nice ribbon. I'd like it to be as authentic as possible with as much money going to the craftsman as possible. I'm willing to spend in the neighborhood of $200. I could be coaxed into spending more and would happy to spend less, but I'm looking for something that will contribute true pride of ownership and is clearly a cut above my current Biltmore Panama (which isn't a bad hat, by the way). HI, Scotty. Check around some of the threads here and you'll find that a lot of these folks are wearing Panama Bob's hats. I have one ordered and have been checking the front door every day anxiously waiting for it to arrive. For the money you're willing to spend you will be able to get a pretty nice hat. Robert's website is www.panamas.biz I believe. I assume that you use your current Biltmore Panama as the everyday Panama hat. If you look for something that will contribute true pride of ownership i.e. 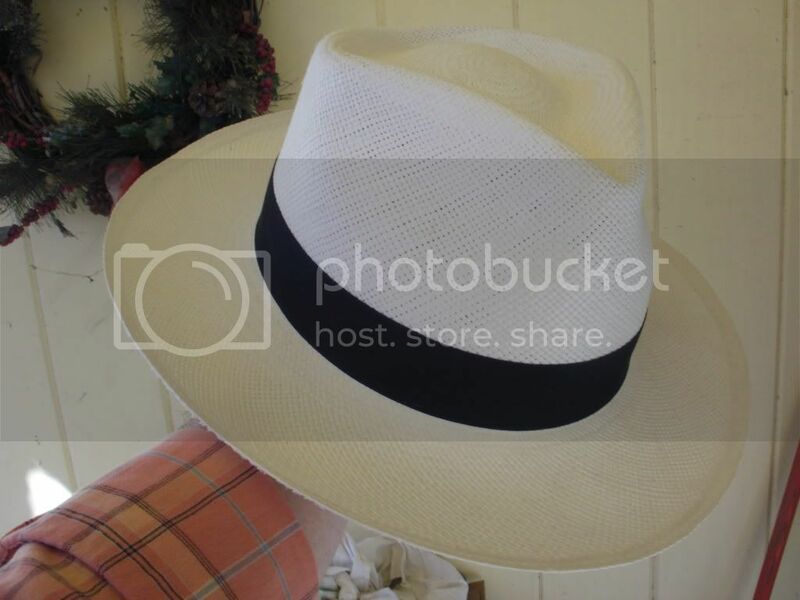 dress panama hat - that is a Montecristi. I would also say you can get the best value for that (or any other) amount with Panamabob. The dress hat won't be a better sun protector neither will it be waterproof - it will be simply a nicer hat. Does anyone know about the seller called "Ultrafino" on EBAY? His prices seem reasonable, and he differentiates between Montechristi's and the other panamas. Plus he seems to keep an inventory for shipping. I've ordered Ultrafino Montecristi from ebay and did indeed get a Cuenca. Buyer beware....not sour grapes. Ask her about it, as the Indiana Attorney General certainly did when I turned her in for fraud. I have a great hat from http://panamahatsdirect.com/ If you join their mailing list, they send you out nice video's about the hats, and also sale notices from time to time. They also tell you the hat fit (normal, long oval). Their standard blocks are nicer then panama Bobs unless you want to spend the extra money for Art to fix it up for you. But their sweat band is not as nice as Bob's, comfortable, but not as nice. My two cents worth anyway. A breathtaking panama bob montecristi blocked by Art for Zohar c. 2004. You could get a panama bob montecristi and have either Art (I dunno if he still does this) or Gus Miller of Batsakes in Cinci block it for you, see here: Gus Miller of Batsakes panamas Bob sometimes seems to have a few of these in stock. I have never seen one in the flesh, but they look very nice, leather sweat & a sweet, crisp block. Wonder what that would look like with a thin ribbon? Which Biltmore do you currently have ??? Just one more marble on the scale ... PanamaBob is a great choice for a good deal. I think you'll get the best bang for whatever dollar amount you are willing to spend. Even better if you can spring to have Art block it. Any idea how much extra it would cost for a Art-blocked Bob-hat? I'd like to think it would look right at home on my head! I don't feel comfortable answering the $ question until I take an ad up out top or in the magazine, which I am planning to do soon. I want to defend our "Standard" blocks as referenced above. They are hand pinched Ecuadorian blocks, not "Standard" Blocks. All orders have the option of Ecuadorian hand pinched, USA blocked, or Ecuadorian blocked. I'll answer that $ question since my Panama Bob Momtecristi is currently at Art's for a reblock and clean. I paid $99 for my 300 weave/inch Montecristi. It found it's way into a swimming pool so I sent it to Art, who has it as I type. Art quoted me $35 for the reblock, more if the sweat has to be changed. Cheap at twice the price IMHO. I'll need something better than the Shantung straws I have now for The Evil Viciousness called "summer" around here. Nice as they fit, they're not very cool. The "Trilby" model at PanamaHatsDirect looks good, and they can weave a shorter brim for me and swap out bands, right? What about the crown height and taper to the models at Panama Bob's, like the Teardrop? PB is THE guy to, to to get a DECENT Panama at a FAIR price for sure Here's one of his Cuenca brisa weave Cabalero styled sale hat's I just got for $9.99 from him. It is a teardrop shaped crease and it's dims are as follows: 2 3/4" brim, 4 5/16" @ front of pinch, 4 7/8" @ tallest side and 3 1/2" @ back. I would say these were probably about average for this style creased in Ecuador as this one is. Ha! Yes, "The Swamp" is my name for New Orleans, aka the horror-show of the American South. I've lived here nearly all my life, and hated it for almost as long. That Cuenca Caballero style looks great. Can he trim the brim a bit, or is that something that must be done as the hat is woven? And can the brim be shaped, by him or me, to have a nice snapbrim swoop in the front? I have a fifteen year old "Plantation" model by Brent Black. This gentleman is the real deal, I spent many hours on the phone with him way back when. My hat looks as good as the day I received it. His website is chock full of good info; I couldn't recommend him any more highly.